I purchased this ring due to my original wedding set being sized and the diamonds continued to fall out. I was so excited when i received it. First i received it early. The box that it came in was pretty and showed nice quality. 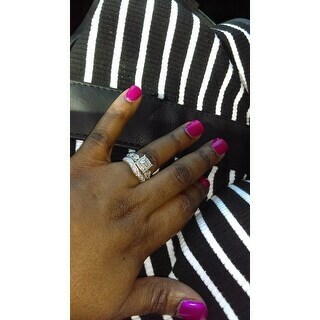 When i got the ring out the size was perfect! I bought this one due to the detail on it. I have has this ring for 2 years and it still looks new. I have not had any stones fall out, yes it gets dirty and needs cleaned but has not tarnished. I would recommend this ring to anyone that wants a smaller but detailed ring! Ornate twists and looping designs breathe life into this gorgeous sterling silver bridal set. The engagement ring has a simple white diamond within a square halo of diamond accents and pebbled detailing for a touch of subtle sparkle. 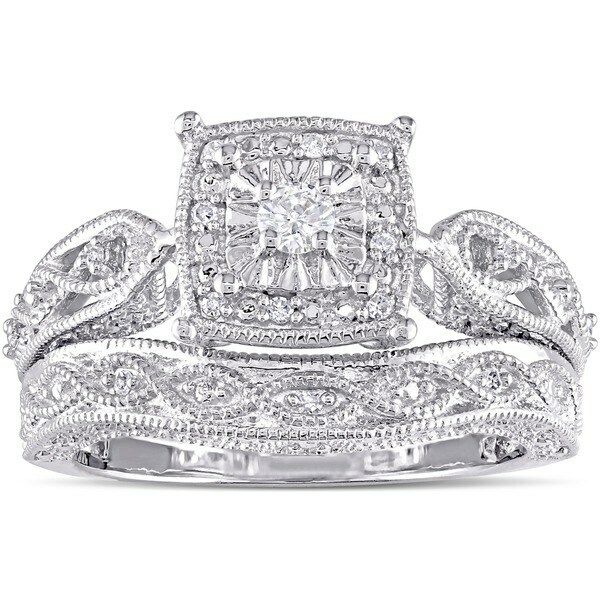 Its sterling silver bands are embellished with crossing ropes of milgrain designs and shimmering white diamond accents. All weights and measurements are approximate and may vary slightly from the listed information. *T.W. (total weight) is approximate. 1/5 carat T.W. may be 0.17 to 0.23 carat. Treatment code N (white diamonds). See Treatment Guide for further information. This ring set cannot be resized. 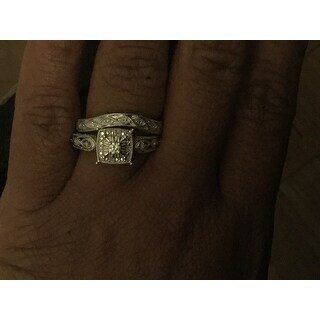 When I ordered(being honest) I was skeptical after I read the reviews, so glad I didn't listen to the bad ones that said it was going to look cheap, diamonds small (they are a little bit sparkles perfect) they said the ring was little(great size to me) wish it came with a second band for the top and it would have covered the whole bottom of my ring finger(and I have long fingers lol) However I have not experienced a falling out diamond yet(and pray I don't) the ring looks so elegant and I've gotten so many compliments on it.. My husband and I decided on this ring together..we've been married 12yrs and we're in our early 30s(highschool sweet hearts) so I've seen some great rings(on me friends and etc. and this ring can definitely hang with the big dogs lol) It's an amazing ring and I LOVE IT! I wish I could load a picture of it on my hand because the picture up top just doesn't capture the entire beauty of this ring! Great buy! 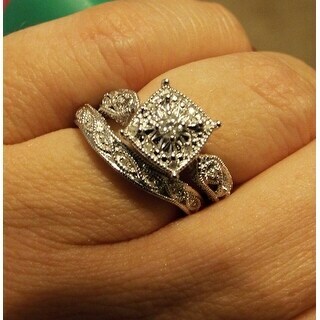 This ring is so beautiful! Ordered a 9.5 and it fits perfectly. Has a strong presence. Love the vintage style and the price is just right. Got the diamonds checked out and they are the real deal. You won't be disappointed with this purchase one bit! I have some questions on this ring because I have had people tell me about my ring. 1) I have heard (from a jeweler friend) that the metal wasn't sterling silver. 2) I took my ring in to get cleaned and asked her to do an inspection, and she said that the metal was real but that it was cubic zirconia. The site says it is a natural diamond, not lab created, I would like to get this straightened out. It has different cleaning properties and care properties, I would like it to last for awhile because I love it and having the correct information would be awesome. I am in love with this set. I find it comfortable and beautiful. The diamonds are small, but that was expected, as it's 1/5 carat and there are many settings. I am so happy with it. This ring is even more stunning in person than the photo can capture. Purchased it for my fiancée (obviously) and she absolutely loves it! The stones combined with the filigree design and craftsmanship really make it stand out especially compared to those that you may find at your local, "W" titled discount store. An excellent choice for the budget conscious romantic. Only downside is that the ring is not represented in the photos as being in two parts, the engagement ring and accompanying wedding band. Other than that, a great ring for the price. I love this ring it is beautiful and I'm constantly getting compliments on it but the diamond have fallen out of it three times. The first time a diamond had fallen out it was less then a month after purchasing the ring then another one fell out over a year later and I had to get it fixed again. I got the 2 year warranty on the ring they completely replaced the ring after the diamonds fell out the 2nd time. A few months later two diamonds fell out again and now the band broke right where it connects to the center of the ring. I went to make another claim but it says the my warranty is over when I should have over a month left on it. This ring is still my wife's favorite. The look of shining silver with diamond cuts and the order size was great!!! Didnt have to get fitted at all! This Miadora ring I cant believe sales at such a price. I thought that this ring was the perfect gift for my 25th anniversary. I loved the ring and was total happy with the price of the ring. Unfortunately I lost the band for the set and unfortunately Overstock don’t sell the band separately or I would have order a new band by now. But still pleased with the purchase and got lots of compliments on the set before I lost the band. The ring was an excellent choice for me. I took great pride in presenting it to my finance. If you're on a tight budget, this is the ring I would recommend. It shines and sparkle from a distance. I love it!! My husband bought this ring to replace my wedding set. I love it. Larger than I thought it would be. Pictures does not do it justice. This ring is good quality and it looks very nice on my hand. I would recommend this site to my friends and family. When I saw this online , I thought it was really pretty & read a few of the reviews & thought that I would purchase it.The online picture does nothing for this ring, it's beautiful in person. The wrapping & pretty silver box it arrived was pretty & a card for the authenticity of the product was a nice touch as well. Very nice ring set. I love the style. I think it has a antique look. Fits perfectly and shines brightly. Good price. Pleased with purchase and arrival time. I proposed with this and she loves it. The wedding ring will of greater value hopefully from this same designer. SHE LOVES THIS ONE THOUGH!! Loved this ring. Very beautiful. Get compliments all the time. Would recommend if looking for second wedding ring set. "Will the sterling silver tarnish?" "Will I get the band and ring for this price"
"Does the ring come with a certificate for the diamonds? Does it come with any form of proof or guarantee that both the 'natural' diamonds and the 'sterling silver' is real? 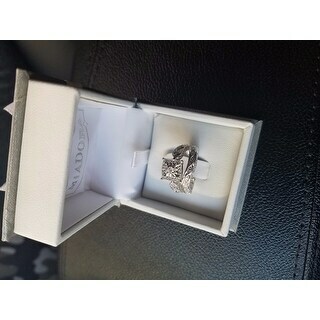 I have read many reviews on this site which say it looks painted on, and jewelers have said that it is fake silver and not diamonds, but in fact CUBIC ZIRCONIA. I would like to know what exactly I am buying. Also how long would the shipping around the world be? Or do you not ship to Australia?" Yes my Wife love this ring and it does come with the certificate for the diamonds, went you receive the ring. Hope this help and it real. "Can I order 2 bands instead of one, I'm puertorican and we normally like " band,diamond ring and band" ?" "Do these fit big or small?" They range in different sizes up to a 10. "Can you buy this ring without the band? " No you can't buy it without the band, nonetheless it is a lovely pair. "I have the Milgrain bridal set and I was wondering if I can buy the band by itself? 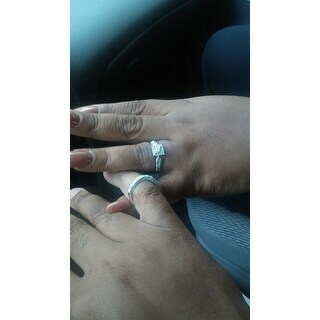 I want to have another for the other side....so the wedding ring will be in between the 2 bands"